Pastor Israel Temitayo Ariyo who is the pioneer and newly inducted District Superintendent of Christ Apostolic Church, Pentecostal District, Life and Power Zone, Odokekere, Ikorodu Lagos is one of the bright prospects of CAC Worldwide. CAC NEWS caught with him at his induction service which was held recently. He speaks on quite number of issues. EXCERPT ! How do you feel to have been inducted as the pioneer District Superintendent of CAC Pentecostal District? I see it as a call to service. In my speech during the induction service I remember I said my meat is also the meat of Christ. The meat of Christ is to do His will and finish His work. I believe that any privilege to be lifted in the ministry is not for showoffs, rather it is a call to service. For instance, by the time you begin to go into the record of patriarchs of Christ Apostolic Church, I don’t think any of us should glory on anything because we have not done half of what they did. I was told that one of the fathers who is the most travelled Evangelist planted so many churches, but never claimed one, rather he gave everything to CAC. It is just a privilege to be lifted as a District Superintendent. I see it from the angle of there is more to be done. In Nigeria alone there are many places gospel needs to be taken to. Here in Ikorodu axis there are a lot of places that are still craving for the gospel and that should be a concern. Imagine those who call themselves international preachers who have not reached their local levels for Christ. When Jesus was here on earth, it was not just business as usual, it was a serious business. He was so busy that he couldn’t find a place to put His head. He was so committed to the work. The role of District Superintendent shouldn’t be seen as an executive calling, but a call to service. What is your vision for Pentecostal District? I will not call it my vision, rather the vision of Christ. There is a blueprint of the ministry work in the Bible and if anybody is going to really make God happy, the person has to follow the blue print of Christ. Jesus talked about reaching Jerusalem, Judea, Samaria and uttermost parts of the earth. Here in Pentecostal District we have challenges facing our Jerusalem, especially Ikorodu axis. For instance, Odokekere which is our domain is a typical idolatry environment and by the grace of God our focus is how the gospel of Christ will fully take its root in Ikorodu axis. In this broad daylight of the gospel, Ikorodu is still covered in darkness. People are living in fear. There are serious occultic practices all over Ikorodu and its environs. We believe if God has done it through our fathers, He can still do it in our generation. The root of occultism will be uprooted and Christ shall take preeminence over the land. There are so many places in Ikorodu that are yet to have the taste of what the gospel of Christ is and our focus is to reach out to those environments. It is not going to be my own personal work and that is why we want to follow the step of Christ. Before Christ could fulfill His purpose, He made disciples. Our vision in Pentecostal District is to ensure that all our members are not just church members, but true disciples of Christ who are not serving God for what they want, but they are serving God for what they can do for Him. There are people who serve God for material things they need. But we want people who desire God and responsible followers of Christ. People God can rely on to go extra mile for Him. Our focus is to raise disciples among our children, teenagers, youths, men and women that will repeat the experience of the days of Light of the World Society and CACSA days in our church. We live in a time where wild practices are on the increase. Our emphasis is to continue to prepare the church for the kingdom of God. I will go back to my message during the induction service, I said we are going to do three things; we are going to teach God’s will, do God’s will and finish His work. How many assemblies do you have under Pentecostal District? Being the pioneer Superintendent of Pentecostal District, do you see it as fulfillment? The word “fulfillment” should not come in at all at this stage. This is because I remember God promised the Israelite Canaan land, and when they got to a place called Shunem which has some characteristics that include 12 springs of water, 70 palm trees and many more they thought they were fulfilled. The Israelites felt fulfilled because they thought it was a place of comfort, but primarily God did not promise them Shunem. The promise was Canaan. Being a District Superintendent is not a fulfillment. There is still much work to be done. Imagine someone was giving kudos to one of the patriarchs of CAC but the Baba replied that “don’t give me kudos now. I can only receive your kudos when all my black hair turn to grey hair and they are beginning to remove one after the other.” My present attainment is not a fulfillment to me. I just see it as if I am just starting. Church planting is one of the visions of the Regional Superintendent of Akinyele Region, Pastor Moses O. Yusuff. Are you looking toward this direction? The church planting vision God gave to Akinyele Region is also the heartbeat of Christ. By the special grace of God I was the Evangelism Secretary when I was in CAC Student Fellowship , Federal Polytechnic, Ado-Ekiti.I will say I received the call of God on an evangelical field and here in Pentecostal District that is our commitment. We hold community revival on every second Saturday of the month. It is a programme we take from one house of our members to the other. 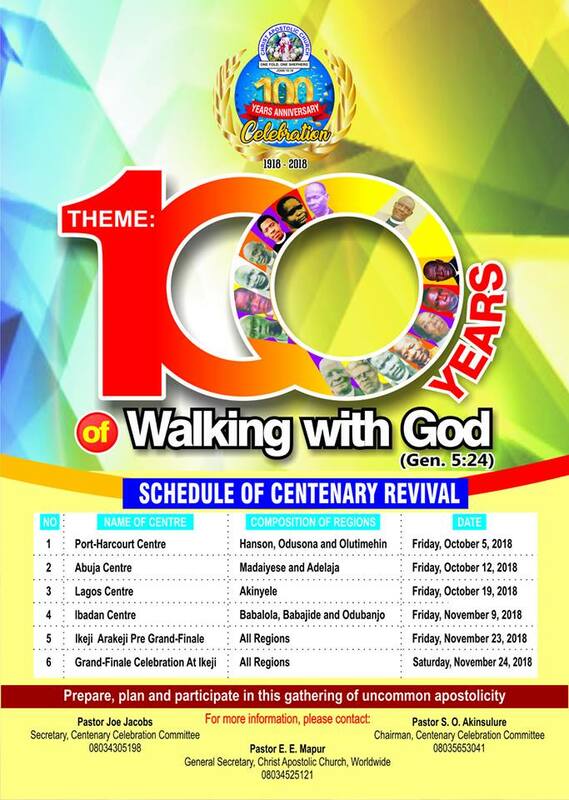 It is a programme designed for the purpose of evangelism in our environment. I celebrate the vision of the leadership of Akinyele Region because it is also the vision of the Master (Jesus Christ). 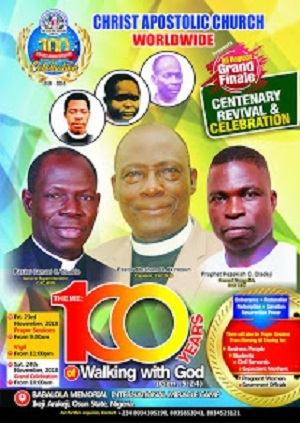 What is the growth projection of Pentecostal District. Should we be expecting Pentecostal District to metamorphose to Pentecostal Zone in the next couple of years? I don’t think becoming a district, zone, or DCC should be seen as fulfillment. Our concern is that Christ must be preached. By the special grace of God our vision is to have members who are fully converted. The only fulfillment for me is when we have all members of the church fully converted and ready for the Kingdom of God. The fulfillment I see is when our environment is reached for Christ. The fulfillment I see is the light of God taking over places where darkness pervades. You are one of the youthful pastors we have in CAC. What is your message to youths who can’t wait for the appointed time of their manifestation? Life is in stages and process. You can’t jump the gun. Some of our fathers in the Lord went through a lot of tutelage. It takes patience to get to the promise land. It is not a day journey. A lot of patience is needed and even the leaders need to be understudied. By special grace of God I worked in a particular laboratory before fully coming into the ministry at Warri Refinery Petrochemical Company. It was a finished product laboratory. As a Science Technologist, what we do in finished product laboratory is that we sample petroleum products. We bring petroleum products to the lab for analysis and it must have gone through one laboratory to the other. The petroleum products that you see today have gone through a lot of analysis. It is a process. I believe that if God has called any youth into the ministry he or she should be patient. It is the reality that the youth of today are elders and leaders of tomorrow. As youth we should take our time to develop and work on ourselves so that we can be better off when we are called upon to serve. Ministry should be understand from the concept of stages. There are times and seasons in the ministry. There is a time to learn and there is a time to understudy, and there is a time to develop yourself. There is also a time to acquire all the treasures you need. There is also a time of manifestation. If the time of manifestation has not come, then wait because it will surely come. Some of the fathers today who are the leaders of our church are like the errand boys to some of our fathers in the past, but today they are at the top. There is always a time and process.